In my kitchen is an orchid, a magic flower that has been blooming for the better part of the 3 years that it’s been sitting on my counter. Most of the time, I don’t see it. I’m focused on chopping. I’m flipping the eggs. I’m wiping down the counter. I’ve grown accustomed to that flower. But sometimes I stop. Like this morning. And look what I found…. It smacked me right into beginner’s mind. I shifted gears to linger, to peer into the portal of color, to study the textures and structure of the ineffably elegant design. It was as if I’d never seen such a flower before. Zen Buddhists use the lovely word/sound ‘shoshin’ to express this concept of engaged interest without preconception or expectation. Shoshin means to poke into something with the curiosity of a beginner, even if studying a subject at an advanced level. Children exhibit inquisitiveness naturally. But as adults it’s easy to get busy ‘knowing’ and to forget to look into, or beyond, what we think. Practicing shoshin is an opportunity to put aside expectation, bias, perhaps a sense of ego, and to appreciate the familiar in an unaccustomed way. It’s a chance to realize how brand spanking new this moment is. 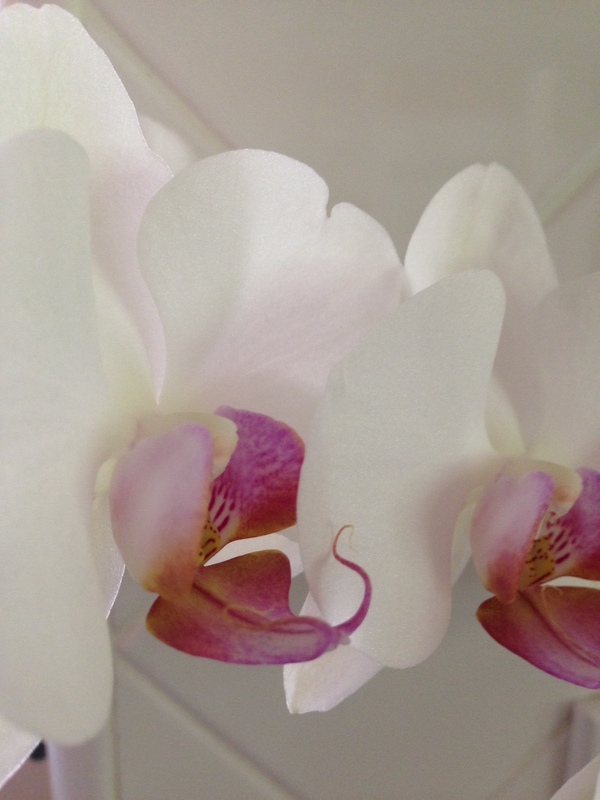 Wonder can propel us right into shoshin, like it did for me with the orchid. A friend’s experience differing from our own is another chance to examine our thoughts from a different vantage point. Choosing to break an habitual action or perspective and try out something new stirs up creative insights. As I do on Fridays, I water my orchid. I tuck four ice cubes in among the roots at the base of the glorious blooms. Water flows from my tap. Under the spell of the orchid, I notice that the water is still cool from the earth where it has lain in the dark for millennia, soaking up minerals, seeping through cracks, exchanging ions, and now arriving here, clear and lovely against my skin. An unassuming miracle that meanders through my everyday. What tugs at your child-like curiosity today? What snaps awake your beginner’s mind? What invites you to begin again? This entry was posted in Curiosity, To Begin Again and tagged Shoshin. Bookmark the permalink. Thank you for your lovely words, Julie! Me, too! on back to an orchid moment. Maybe an ‘orchid’ / shoshin connection will be sprouting in us. smiles to you!